Situated a 10-minute drive from the Monastery of Saint Jerome and Generalife, the Albero offers comfortable rooms with a flat-screen TV. The Albero includes luggage storage, a 24 hour reception and ski passes. The hotel also offers a safe, a tour desk and a ticket service. The Albero provides air-conditioned rooms, great for travellers. Heating, a desk with an electrical outlet and a hair dryer can be found in each room of the hotel. The private bathroom in each room includes a shower. 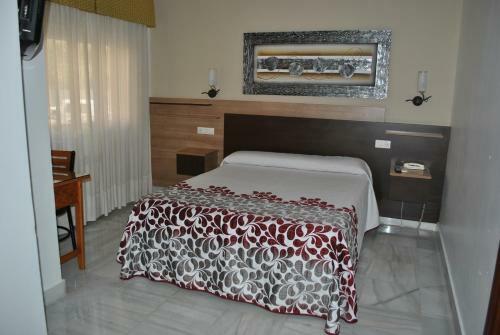 Federico Garcia Lorca Airport is only a 30-minute drive from the Albero. The Madrasah of Granada and Granada Cathedral are less than a 20-minute car ride from the hotel. This hotel is 1626 metres from the Alhambra entrance, 2636 metres from Plaza Nueva (the absolute centre of Granada), 4201 metres from the train station and 5498 metres from the bus station.